WhiteHEAT/USB - Connect Tech Inc. Flexibility: 4 RS-232 compatible serial ports using standard DB-9 male connectors. Speed: High throughput with baud rates from 50 to 460.8k baud. Performance: High performance quad UARTs with large 64 byte FIFOs and automatic flow control, in addition to a 24MHz 8051 CPU. Compatibility: Includes driver support for Windows 98, 2000, CE, XP and Linux. Protection: 15 kV ESD protection on every pin of every port. 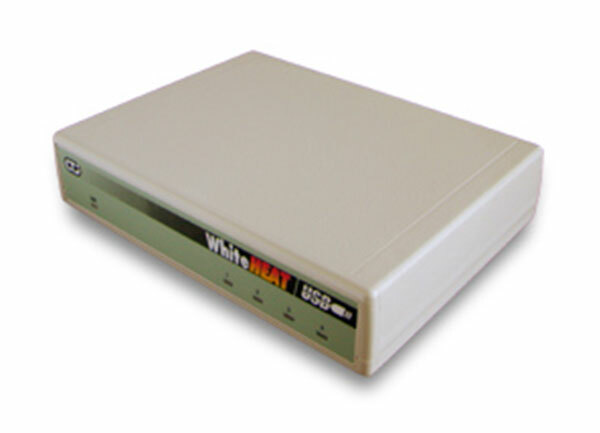 The high performance WhiteHEAT/USB brings a revolution in multi-port serial communications to USB bus compatible computers. This low profile adapter easily and conveniently connects your serial peripherals to your computer, be they industrial infrared sensors or home office fax machines. Affordable, reliable, and fast, the WhiteHEAT lets you Plug and Play to get the most out of your POS device, modem or security device. An available USB port on your system. Looking for a customized USB-to-Serial product? Click here to tell us what you need.